Sample tweet: "Happiness is not a warm gun stock. Smith & Wesson results did not make investors' day. $SWHC down 10% as company posts loss & drop in sales." 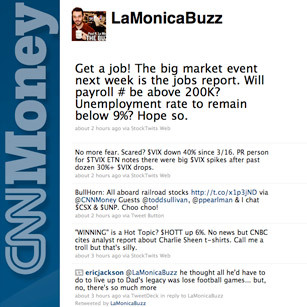 CNNMoney's excellent stock columnist keeps the market exciting. Like the Dow, Paul La Monica moves fast. He tweets 20 times a day or more, offering quick, worthy analysis on the market and the stocks that are rising or dropping the most. Just a quick glance down this feed and you will have a good feel for what happened in the market that day, or what is about to.